Each victory lays the groundwork for the next, because each time we establish the reality and legitimacy of transgender people’s medical needs, we make it easier for others to make the case. Private and public insurers have traditionally simply excluded gender transition-related procedures from their coverage based on the unfounded assumption that treatment is experimental, elective, or cosmetic. Having spent many years laying the necessary foundation to highlight the discriminatory nature of health insurance exclusions, we are now seeing the results of that hard work in better access to health care for transgender people. Gender transition-related medical care is necessary medical care for many transgender people. But getting that care paid for can be a huge barrier. Transgender people are disproportionately represented in prison, and they, too, have limited and, most often, no access to care. Private and public insurers have traditionally simply excluded gender transition-related procedures from their coverage based on the unfounded assumption that treatment is experimental, elective, or cosmetic. Transgender people are disproportionately represented in prison, and they, too, have limited and, most often, no access to care. GLAD has been working throughout the New England region as well as in Washington, DC to reverse longstanding and deeply entrenched policies and laws that have resulted in the denial of insurance coverage. GLAD worked with the National Center for Lesbian Rights and the ACLU on behalf of army veteran Denee Mallon to successfully challenge Medicare’s exclusion of gender transition-related surgeries. A final ruling issued May 30, 2014 by the U.S. Department of Health and Human Services Department Appeals Board removes the threshold barrier to coverage for care for transgender people under Medicare. Mallon was able to have gender affirming surgery covered by Medicare in October, 2014. GLAD represented a transgender woman in her challenge to MassHealth’s denial of coverage for gender transition-related surgery; GLAD had previously helped her successfully challenge MassHealth’s denial of her coverage for hormone therapy. During the pendency of this case, then Governor Patrick announced his administration’s opposition to the existing exclusion and committed to revising the regulations to ensure non-discriminatory state insurance coverage. Those regulations have since been revised ensuring that MassHealth recipients have the opportunity to make the case for coverage in individual cases of medical need. In response to GLAD’s advocacy, Connecticut has also revised its state Medicaid program to remove the discriminatory exclusion. 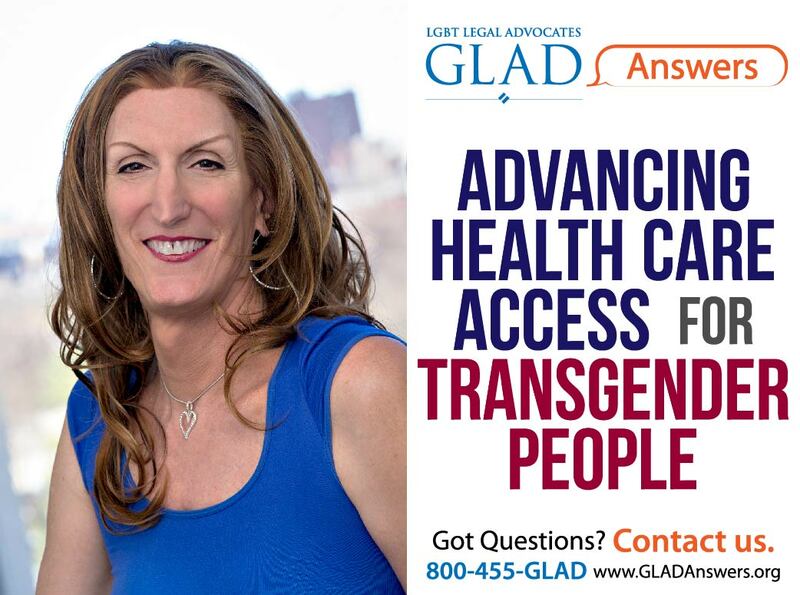 GLAD is working to ensure that New Hampshire’s Medicaid program covers gender transition-related care. Anyone who is currently on Medicaid in New Hampshire and has been denied such care should contact us at 1-800-455-GLAD (4523) or www.GLADAnswers.org. GLAD represented a Massachusetts state employee denied surgical coverage by the Group Insurance Commission (GIC) plan. Following then Governor Deval Patrick’s urging of the GIC to remove its discriminatory exclusion of coverage, GLAD was able to successfully advocate for our client to receive coverage. The GIC since voted to remove the discriminatory exclusion. In Connecticut, GLAD advocated on behalf of a transgender state employee who was initially denied coverage for his gender transition-related surgery because of a categorical exclusion in the state insurance plan. GLAD worked with his union representative to secure a resolution from the union eliminating the insurance exclusion for all state employees. Our client has since received the surgery he needed – covered by his state insurance policy. GLAD worked with the Massachusetts Department of Youth Services and other advocates to revise state policy to include gender transition-related care for youth in juvenile justice settings. We are doing similar work in Rhode Island where, after GLAD training on the legal rights of LGBTQQI youth, the Department of Children, Youth & Families consented to a transgender youth’s request for cross-hormone therapy. By working with state insurance commissions, GLAD has expanded access to private insurance coverage in Vermont, Connecticut, and Massachusetts, where state insurance commissions issued bulletins to insurers advising that they could not exclude coverage for gender transition-related care in insured plans. In Vermont, this bulletin was followed by a revision of the state-sponsored insurance plans to remove exclusions in those plans. GLAD is working with insurance commissions throughout the rest of the New England states to secure bulletins clarifying the impermissibility of exclusionary plans, and fighting against legislative backlash that threatens to reverse gains secured in Connecticut. GLAD is asking the U.S. Supreme Court to review the full First Circuit Court of Appeals reversal of an earlier ruling that the Commonwealth of Massachusetts must provide Michelle Kosilek, an incarcerated transgender woman, medical-necessary gender reassignment surgery. Now all transgender taxpayers can deduct their documented transition-related expenses. GLAD successfully challenged the IRS’s denial of a taxpayer’s medical deduction for gender transition related care in O’Donnabhain v. IRS. Now all transgender taxpayers can deduct their documented transition-related expenses.